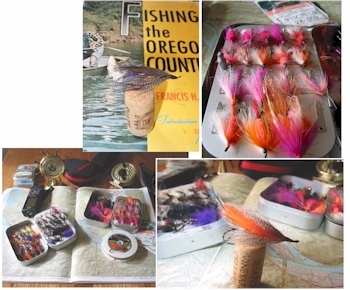 Although we may never understand all of the variables that attract a steelhead to a given section of water, and ultimately what leads to a successful hook-up, the following paragraphs will hopefully give you some ideas to ponder before heading out the door with fly rod in hand. Steelhead can be particularly hard to catch, not necessarily because they won’t pursue a properly presented fly, but because you’re searching for a needle in a haystack. 99.99999 percent of the water is empty, and you’re trying to find that one fish that will take your offering. The reality is that many fly fisherman go years without success. Like most things however, once you consider the variables and process the information more carefully you can improve your chances of success. If you ask any successful northwest steelhead angler what are the most important aspects to becoming successful steelhead fly fisherman they’ll probably answer by stating something like “fish the right water” and/or “confidence”.These most basic of variables do go hand in hand, for without one, there isn’t the other.You most likely won’t catch Steelhead if you aren’t in the right water, and if you don’t catch Steelhead you won’t gain confidence. The fish of "a thousand casts"
Before we even begin to talk about the water that Steelhead can be found in, tactics and fly selection, it is helpful to know something about the life of a Steelhead. While this paragraph isn’t meant to be an exhaustive discussion on this species, we’ll take a quick look at what a Steelhead is. The Steelhead is a sea-run Rainbow trout. Its Latin name is Oncorhynchus Mykiss. Over time, Rainbow trout evolved to go to the sea where they were able to feed more efficiently.After spending approximately 3 years in fresh water as juveniles, they migrate to the ocean as 6-7 inch smolts and feed on the abundance therein. Steelhead may spend 2-3 years in the ocean and may grow to staggering size before returning to their natal stream as sexually mature adults to spawn in the spring. Upon returning to fresh water, Steelhead begin to lose their silvery appearance and regain the color characteristics of Rainbow trout. It is during the upstream migration in preparation for spawning that we fish for Steelhead. Now that we understand what Steelhead are, and what their purpose for re-entering fresh water is, we’ll examine the water that they tend to be found in. While Steelhead must pass through every section of a given water system in route to their spawning beds, they choose certain sections of a river to rest, and/or spend time.This water is referred to as holding water.Holding water is generally described as water that is 3-6 feet deep and flows about as fast as you would normally walk. While this is true, there are subtle variances that also make one piece of water more appealing to a Steelhead than another. Some of the variables that make up good holding water are: flow, depth, river bottom makeup, and structure.By evaluating this basic set of variables you’ll better determine where to spend your time fishing. What creates great holding water is a function of geologic structure and its surrounding vegetation.For any given river system, the gradient, or slope, of the canyon or surrounding landscape through which the river flows determines the speed of the water. So, obviously, in some sections the river flows exceedingly fast, while in other sections within the same river system the flow may be nearly stagnant. High flows would exhaust the migrating Steelhead so they tend to push through fast water as quickly as possible. In extremely slow water, Steelhead may not get the oxygen they require and/or the temperature in the slack water may be above a comfortable level. Another crucial element that must be considered for good holding water is a run that has a deep section where the Steelhead can move to and hide if it feels threatened. In many cases this deep section may be 15 or so feet deep. By throwing away the fast and the slow water, we then arrive at those sections of the river where depth and flow is such that the Steelhead can receive the oxygen it requires, the protection it desires, and without so much force that it would exhaust the fish. It is within these sections that you must concentrate your efforts fly fishing for Steelhead.So now that we have a general idea of the good holding water and what to look for, lets move onto other elements of good holding water. The makeup of the river bottom needs to be considered. The structure for good holding water is usually made up of large stones or gravel.Sandy runs almost never contain steelhead for long as the sand tends to irritate the gills. Look for runs that have stones as large as your fist, maybe larger. In addition to the makeup of the bottom, runs that contain large boulders are especially appealing to steelhead as they offer protection from the currents. Holding water can vary widely in length and width. On coastal streams, holding water may only be 30-40 yards in length and 30-50 yards in width, and in some cases may be even shorter. In contrast, on large river systems, they may be hundreds of yards in length, and may be over 100 yards in width. A very important point to remember is that Good holding water may be separated by hundreds of yards if not miles of river that is either too fast or slow to hold fish.Because of this, having some means of traveling fairly quickly to the next section of good holding water may mean the difference between success and failure. Keep in mind that fishing for Steelhead is seldom if ever a numbers game, one or two fish in a day is considered a very good day! In addition to traditional holding water, other places that may occasionally hold fish for brief periods of time are referred to as resting water. Resting water is found directly above or to the side of a section of very fast water, or a chute.This fast water is usually the result of a large change in elevation over a short distance. As the fish come up through the fast water, or chute, they need a moment to rest before making their way further upstream and will find small pockets of slower, softer water to rest and may take a properly presented fly. Now that you have some idea of what to look for, head to your local river and spend some time observing the water and look for situations as described above.On many small coastal rivers it is possible to gain a height advantage and hike along a given river system while peering into the water. By utilizing polarized glasses, you can now start concentrating on spotting Steelhead. It may take you 10 or 15 minutes of observing a run before finding fish and/or determining that it is empty.Often times, if you can spot one Steelhead you may spot additional Steelhead in the same run.Depending upon light conditions and water clarity, some days are better than others for spotting fish.Look for “shadows” that are about 2 feet in length (fish often look smaller in the water). After locating these “shadows”, look for the wavy motion of a fish as it holds its position.You may also notice a “flash” as the silvery sides reflect light from the sun. Spending time observing fish in their comfortable natural environment will give you a better idea of where fish will likely be the next time you decide to fish. Once you’ve been able to routinely predict where fish will be holding you’ll have better judgment of where to fish on an unknown river. Remember that Steelhead are almost constantly moving. You may find several Steelhead in a specific location today only to find that same location without fish tomorrow. Locate and write down the locations where you have spotted fish. Also write down places where you observe fish caught. This list of locations will be later used as part of your game plan, which we’ll discuss shortly. A very important point to remember is that run timing will also play a crucial role in your success.Sometimes there just isn’t anybody home. You’ll need to do some research before heading out the door to determine whether the river system you’re interested in fishing has fish and when the run is.Some river systems get Summer Steelhead, while other get Winter Steelhead.Some rivers get a mixture of both, but one run may be stronger.Don’t waste your time fishing during periods when fish are absent. Ok, so now its time to customize your own game plan. You’ve done some research, you know which rivers get Steelhead, and when the run typically begins and ends.You’ve spent some time researching a river and have learned where Steelhead typically hold. You’ve checked the flows and have determined that they are conducive for good water conditions.It is now time to grab your fly rod, and head out fishing. Pick one of the runs on your list, fish it thoroughly, and then move onto the next run in your list. By fishing hard, and presenting your fly in those places which are most likely to hold fish, eventually, your efforts will pay off. So far in this article, I've about where Steelhead are found and why they are attracted to various stretches of a given river system. Moving on from there, I’ll describe another set of variables that must be considered to give you a better chance of hooking a Steelhead. By knowing where Steelhead can be found and then taking into account this next set of variables you’ll start to bring more fish to hand. Steelhead are not hard to catch because they are necessarily fussy about what lure is placed in front of them. If you ever have the opportunity to look inside the tackle box of a gear angler, you’re likely to find a rather strange assortment of spin-n-glows, lures, plugs, spinners, and corkies. 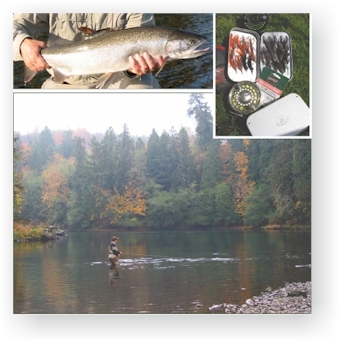 This assortment of man-made objects have all proven themselves effective as a means of enticing a Steelhead to strike. 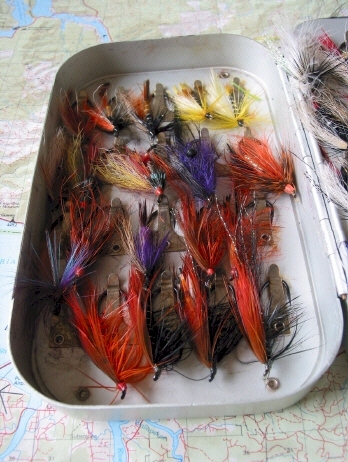 In addition to the aforementioned gear, gear fisherman may also use cured salmon or steelhead eggs and/or sand shrimp. On further examination, one lure may be shiny, one may be dull, one may be bright and another dark. The difference in size from one lure to another may be astonishing. Bait has natural oils and gives off a scent that may attract a Steelhead. But why would a Steelhead strike an orange fluorescent Hot-Shot? It stands to reason then that a Steelhead may decide to strike almost any object that is placed tantalizingly in front of the Steelhead’s nose. The same philosophy holds true as it applies to fly selection. There are hundreds, if not thousands, of effective flies that can be used to entice a strike. Although there are no hard and fast rules, Steelhead fly selection is usually based around water conditions so let’s have a look at what we generally experience in the Pacific Northwest. Many northwestern rivers flow from glacial fields and almost always have some amount of silt present and never or rarely run completely clear. The color of the water flowing from glacial fields has the look of a liquid elementary school chalkboard. It is greenish/grayish in appearance. In general, all rivers will run brown at high water, then to greenish as the water level begins to drop, and then may run clear after a few days to a week of little or no rainfall. Water clarity will play a role in determining fly color and size. For greenish water and water with limited visibility, you want your fly to stand out so large flies in size 1/0 or 2/0 are a good choice. Steelhead are not going to be spooked by large offerings under such conditions. As for color of the fly, bright maribou flies and/or dark flies are generally a good first choice because they can be distinguished from other debris floating down the river. Everyone has their own favorite fly patterns, but those that provide movement and action will entice more strikes. This movement and/or action is probably the single most important factor responsible for triggering a strike. When the water is low and clear, especially during summer and fall, large flies may very well spook Steelhead. Smaller, more drab patterns will usually out produce large bright flies. Steelhead are routinely caught using flies tied on size 6 hooks. Many Steelhead fisherman carry a Summer fly selection and a Winter fly selection, the difference being mainly the size of the flies. Rain is an important variable in the Steelhead equation. As the rain falls, the rivers begin to rise and this triggers Steelhead to migrate high into their native streams. The rising water and the flush of minerals instill a sense of urgency in Steelhead to migrate upriver. They may move upriver quite quickly and they’ve been documented to travel over 20 miles in a 24-hour period. While rising rivers signal upstream migration, dropping rivers tend to set up ideal fishing conditions. After moving further up their natal rivers, Steelhead become more aggressive. You want to time your trips to target Steelhead after the rains have raised the river and when the water is beginning to drop. During the winter months, this may give you a very short window to target Steelhead, especially if you only have weekend days off. Especially during the rainy winter months, once you factor in the rains, your days off, and good water conditions you may have only a few days per month with ideal conditions. To help you determine the flows for your favorite river, you can check the flows of most river systems by taking advantage of information available on the Internet. The United States Geological Survey, USGS, is the agency responsible for posting real time data related to the affects that weather plays on our river systems (check out http://waterdata.usgs.gov/nwis). By utilizing this site, you can observe hydrographs on many river systems. The hydrographs detail water flows over time and you can use them to your advantage to find optimum fishing conditions. As previously mentioned, optimum conditions are those where the river is falling, or dropping into shape after significant rainfall.In addition to government sites, there are numerous Fly Fishing forums where you can ask questions about your favorite watershed before heading out the door. It pays to do some research before you leave home. Light plays another important function in being successful although its affects are much more pronounced during the hot summer months. Some runs are situated such that the sun shines directly into the Steelhead’s eyes at various times of the day. Fish do not have the benefit of eyelids and direct sunlight can be blinding. You should make it a priority to fish those runs that are shaded, or fish them when the light is either off of the water and/or coming from behind the fish so that the fish actually has a chance of seeing your fly. Vegetation along the river can provide shade and you may be able to entice a fish to a fly by fishing in the shaded areas during mid-day. A few final considerations . . .
Because of the long hours required to hook into Steelhead, every effort must be made to minimize the time it takes to cast and maximize the time your fly spends in the water. It doesn’t matter how good the fishing is, if your fly isn’t wet it won’t catch fish. If you’re using a single-handed rod, don’t make more than two or three false casts before letting your fly settle on the water. Tie good knots and learn how to tie them fast. I’ve observed anglers taking 10 to 15 minutes while trying to tie on a fly. Just like casting, learn how to minimize down time. Keep your hooks sharp. You don’t get too many opportunities to hook into a Steelhead so you want to make sure that when it does happen you put the odds in your favor. Through the course of the day your flies come in contact with many objects that dull the hook.Check the hook often and make sure that it is kept sticky sharp. Pick a run and fish it through thoroughly but it is also important to remember is not to spend too long fishing any one location. The number one rule is Don’t give up, they aren't called the "Fish of a Thousand" Casts for nothing!